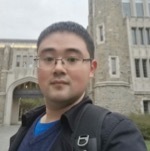 Jian is a visiting student from Jilin University, China and joined the Franklin Group in November 2017. His research interests include the low frequency noise performance of nanodevices and their reliability. Jian is now devoted to the investigation of noise behavior in the new devices studied in the group. Besides his research, Jian loves museums, music and different cultures.